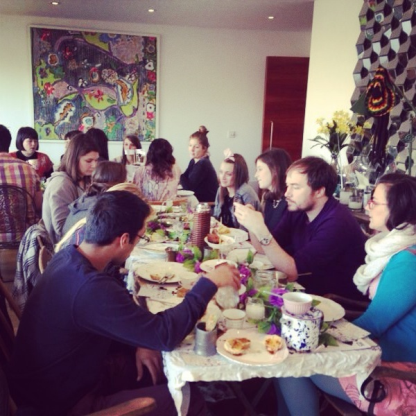 Supper Club host Christabel is spoiling us over Easter with two events - a Thursday night supper club and a Sunday Brunch - over the Easter weekend. Go an spoil yourself - hopefully you won't need to get up the next day. "This is a seriously saucy supper club that is dead set to impress - set in a banging (secret garden) setting, overlooking the Regents Canal, - with an EGGcellent twist! BRACE YOURSELF to enter into a candlelit, magical, mystical haven of flowers, foliage and seasonal food, inspired by a stage at The River Café - you will witness attention to detail second to none. Hit this up if your looking for a memorable immersive, dining experience, all set in a truly one off unique setting." "What better way to spend Easter Sunday than over a truly EGGcelent Mad Hatters Brunch. I have big weakness for a hearty brunch as well as a minor obsession with the quirky mis-match and surreal world of Alice in Wonderland. So, what better way to combine these two fetishes than with a mad hatters brunch party? And when you're overlooking the wonderful Regents Canal, your imagination will transport you even further! Pancakes with crispy bacon and maple syrup, toast with eggs and marmite, scones with cheddar cheese and chutney are but a few of the tried and tested, weird and wonderful concoctions that I will be whipping up. I will be using the completely delicious and unique chutneys from Rubies in the Rubble and the tea is courtesy of Tea Pigs. The ticket price includes brunch fit for a king and a mad hatters cocktail on arrival."